Twenty-five years ago, I stood and watched as a screaming buzz saw tossed clouds of sawdust into the air while slicing through thick logs of Douglas fir at the Pope & Talbot sawmill in Port Gamble. Last week, I walked across the vacant site of the old mill, which was torn down years ago. Along the edge of Port Gamble Bay, I could hear nothing but the sound of the wind and an occasional call of a seagull. 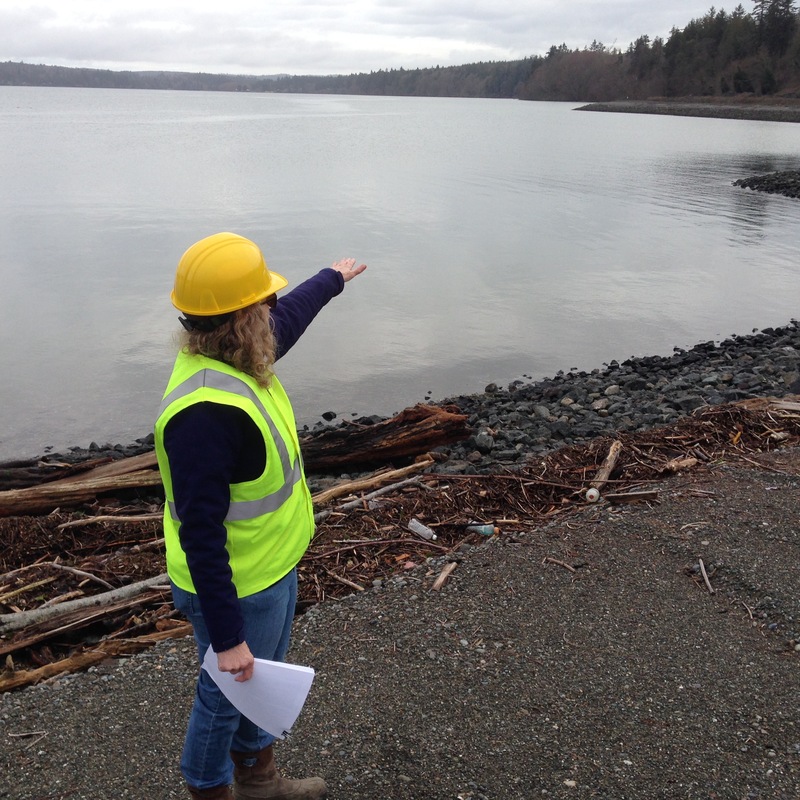 I came back to the old mill site to see how things looked following completion of the $20-million-plus cleanup of Port Gamble Bay. Some 111,000 cubic yards of dredge material is now piled up in the middle of the site, an amount roughly equivalent to 10,000 dumptruck loads. In addition, nearly 8,600 wooden pilings — most imbedded with creosote — were removed and shipped off for disposal, making it one of the largest piling-removal projects in state history. The final number of pilings removed far exceeded original estimates, largely because buried ones kept turning up during the removal work. “It’s a huge relief to get this done,” said Jon Rose, vice president of Pope Resources who has overseen a decade of planning and cleanup. “It has been very hard on our staff, hard on the town, hard on our financial statements. What was once the raggedy edge of Port Gamble Bay is now a smoothly contoured and sloped shoreline protected with a layer of rocks about the size of a basketball. A tiny cove was formed on the southern shore of the mill site, where an unexpected pocket of wood waste was discovered. Jon said his company will soon reactivate plans for redeveloping the town of Port Gamble with new houses, a hotel and agricultural amenities of interest to visitors. The plans, which must undergo county studies and public hearings, won’t vary much from those submitted to Kitsap County in 2013, he said. See Kitsap Sun, March 16, 2013. During the final three months of the cleanup project, work proceeded at a frantic pace, as contractors battled night tides to complete the work within the so-called “fish window” — that is before schools of herring began arriving in Port Gamble Bay. Most of the dredge material consisted of wood waste left behind by 142 years of mill operations. In addition to sawdust and wood chips that had spilled into the harbor, the waste included bark and chunks of wood from untold numbers of logs floated to the mill in vast log rafts. In places, the wood waste was up to 20 feet deep at the bottom of the bay. A vibratory hammer clamped onto the end of a piling shakes it loose for easier removal. Decomposing wood waste reduces dissolved oxygen levels, causing harm to aquatic species. Sulfides, ammonia and methane can be generated under the anaerobic conditions in the sediments, making it hard for bottom-dwelling creatures to survive. Once the woody material was removed from the bottom, a “cap” of clean sand was layered over the dredged areas, covering 87 acres. In all, about 224,000 tons of fill material — mostly sand — was brought in to restore the site. 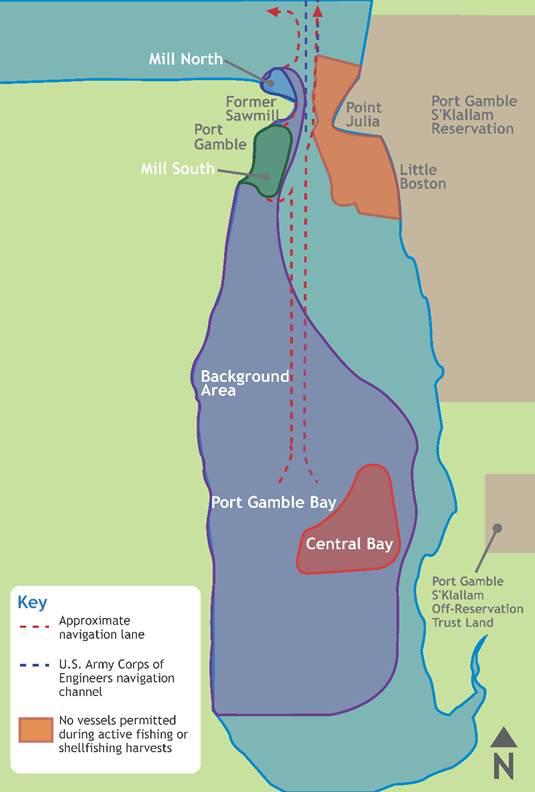 Eelgrass has been planted in suitable locations and will be monitored for years to come. The dredge material, now spread out across the mill site, is undergoing a cleansing of sorts in the rain, which is washing out the saltwater. A sprinkler system has been installed to help complete the salt removal, leaving debris that is expected to test clean enough for disposal on another portion of the Pope Resources property. Out of the thousands of upright pilings removed, only two or three were broken, according to Linda Berry-Maraist, who is managing the project for Pope Resources. At the beginning of the job, contractors experimented with various methods of removal and learned that the pilings could be loosened with a vibratory hammer, a piece of equipment that shakes and loosens the post. 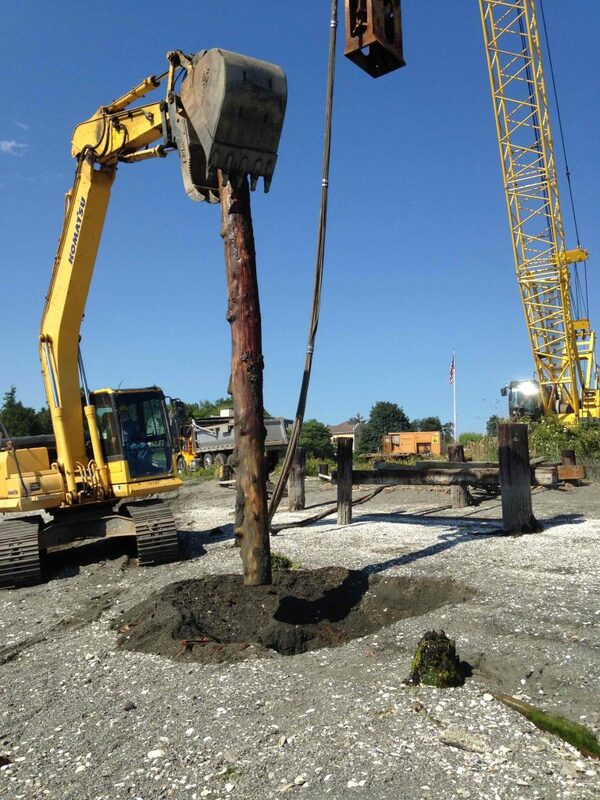 After the piling is loosened, it can be lifted smoothly out of the ground. Orion Marine Group of Tacoma was the primary contractor on the project, while Anchor QEA of Seattle served as the environmental consulting firm. As Linda and I walked across the old mill site, a large flock of resting seagulls launched themselves into the sky, swirling around in a mass of flapping wings. Farther down the beach, Linda spotted the tracks of a deer imbedded in the soft sand. Leaving the mill site, Linda drove through the town, showing me the location of future homes to be built in the style of the remaining historic homes. Nearly completed is a new $5.6-million advanced sewage-treatment plant, which will dispose of its clean effluent in a community drainfield. Once the new plant is in operation, contractors will remove the old sewer outfall, which releases effluent into Hood Canal. The agricultural district, where the historic farm will continue to operate with greenhouses and tourist-related agricultural activities plus a possible winery, creamery and such. 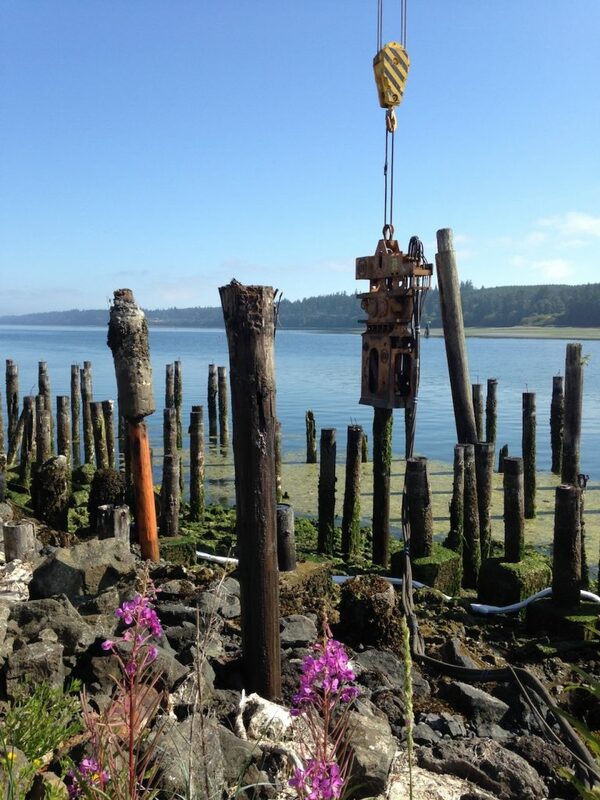 During the recent restoration work at the old mill site and in Port Gamble Bay, the quiet town of Port Gamble was nearly overrun with large trucks carrying old pilings away from the site and clean building materials to the site. The sound of construction activities filled the air, sometimes continuing into the night. People in the community deserve thanks for tolerating the noise and activities as best they could, Linda told me. Now, for the most part, quiet has returned to Port Gamble. Thanks for the very interesting article on the restoration of the old Pope and Talbot sawmill site. I lived in Poulsbo for over 35 years before moving to AZ, and I’ve always wondered what would happen to the properties in Port Gamble. Port Gamble was always one of my favorite places to visit.